Schlock-Wire: Shout! Factory’s S.W.A.T. : THE FINAL SEASON Hits DVD In May – Schlockmania! From television drama masters Aaron Spelling and Leonard Goldberg comes the story of the ‘Special Weapons and Tactics’ unit, an elite five-man team the police call when the police just aren’t enough. On DVD for the first time, S.W.A.T: The Final Season will be released May 22, 2012 from Shout! Factory. The six-disc set will include all 24 action-packed episodes and has a suggested retail price of $44.99. 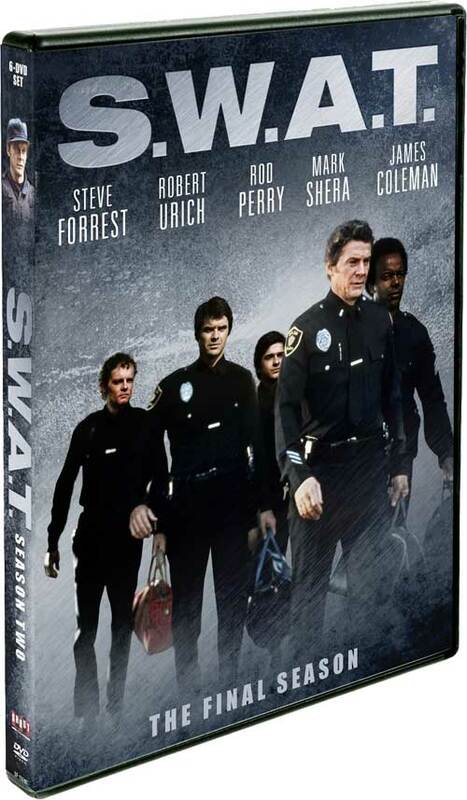 One of the most memorably intense cop shows of all time, S.W.A.T: The Final Season is a must-have for fans of police dramas, classic TV shows and DVD collectors. Starring Steve Forrest (The Longest Day) as the elite team’s commander, an early starring role for Robert Urich (before he was featured in the series Spenser: For Hire) and a parade of notable guest stars including Sal Mineo, Susan Dey, Lesley Ann Warren, John Vernon, Aldo Ray, Carl Weathers, Deidre Hall, Frank Gorshin, Donna Mills, Stuart Whitman, Leslie Nielsen, Tom Skerritt and Robert Loggia, the second action-packed season of S.W.A.T. promises to deliver one explosive ride!